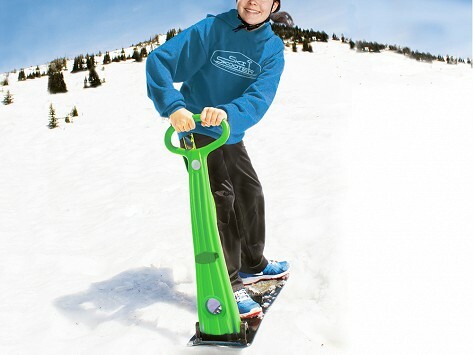 When you add a handle to a snowboard, you get a snow scooter—a fun, new way to spend time outside. 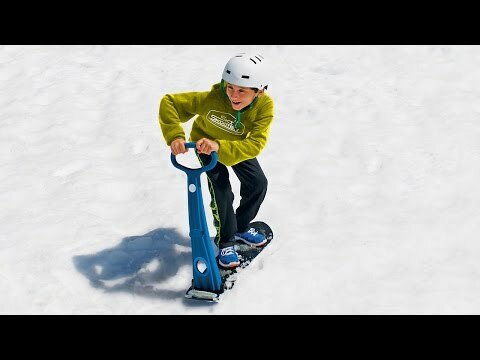 The Ski Skooter gives kids the feel of riding a snowboard, but with an adjustable handle that can help with balance and steering. The lightweight, durable body folds down to store until the next snow day. Dimensions: Folded: 36" x 9" x 5"; Upright: 36" x 9" x 32"
We ordered five of these kick scooters for grandchildren for Christmas, so my late reply....the kids absolutely loved these, sing them Christmas night, grateful for the Spokane snow. They work well, fold up nicely to travel in the car to other sites, and lots of other parents wanted to know where I got them. I was able to order the several colors, so that the kids can keep track of their own snow gear. Bought 3 as gifts for grand kids for Christmas so haven't been used yet. Delivery was very prompt. They look like they will be fun. A snow scooter gives kids a reason to stay outside even when it's cold. This snowboard-scooter combination is a fun new way to play in the snow. The adjustable handle helps kids stay balanced while giving them a hand with steering. The board’s non-skid surface lends some extra grip, too, but they should wear a helmet, just in case. The lightweight, durable body folds down for easy storage between runs, or to stow it in the trunk when you take it along on trips. We think this sled alternative will keep kids busy, happy, and even more likely to wish for a snow day.